These Instant Pot Unstuffed Peppers are a quick and easy alternative to oven-baked stuffed peppers and take minutes to make in the Instant Pot! Stuffed peppers is always a really popular, easy dinner meal in almost every home. When I make stuffed omelet peppers for breakfast, the kids LOVE me. When I decide to make them for dinner, they go even crazier. Not only are they easy, they are versatile – make them meatless, or stuff with ground turkey or chicken. 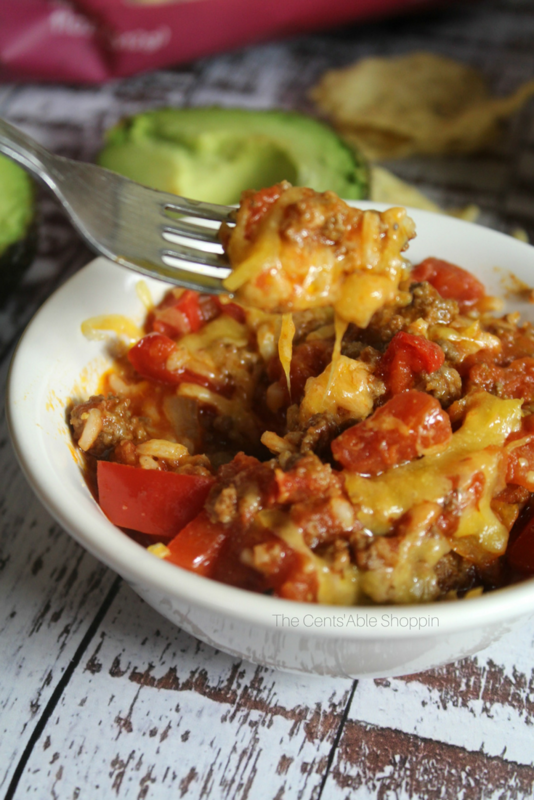 If you are looking for a switch on that traditional recipe, I think you’ll love this easy meal for unstuffed peppers. They are made in just minutes in your Instant Pot. This recipe is quite handy in the summer, simply because you don’t have to turn on an oven. Phoenix can get quite hot, y’all. And the last thing you want in the 100+ degree heat is to crank on that oven and heat up the house even more. Pull out your Instant Pot and crank out these unstuffed peppers in a fraction of the time as regular stuffed peppers. This recipe takes just a single [large] bell, or two smaller bell peppers – cut into slices, and those slices into thirds. Brown some ground beef in the Instant Pot with some diced onion and garlic using the saute feature – don’t forget to season well! Then add in a little rice, your bell peppers, Worcestershire sauce, a few pantry staples and some chicken or beef broth and within minutes you’ll have a quick and easy (might I say delicious?) dinner that everyone will love. I’d totally jump at the chance to eat unstuffed peppers with garlic bread and a side salad. This is almost too good to believe that it only took you a few minutes in your Instant Pot. These types of dinner recipes can truly transform your busy weeknights! A traditional twist on stuffed bell peppers, Instant Pot Unstuffed Peppers is an easy, family friendly meal with a few simple ingredients, made in just minutes in your Instant Pot! Use the saute feature to brown your ground beef, onion and garlic in your Instant Pot (oil is optional); season as needed (salt, pepper). Drain any fat, making sure to keep the ground beef in the pot, and to the pot, add the bell pepper, rice, diced tomatoes with juice, tomato sauce, broth, and Worcestershire sauce (or substitute) - no need to be perfect, just dump in the pot. Give everything in the pot a good stir, and place the lid on the Instant Pot. Seal the valve. Set the timer for manual (high pressure) for 5 minutes. Once the pot beeps finished, natural release for 3-4 minutes, then do a quick release with any remaining pressure. Serve in bowls and top with shredded cheese . Refrigerate leftovers and enjoy within 48-72 hours. *We prefer not to use soy sauce, and we aim for soy-free Worcestershire sauce in our home – if you aren’t as concerned about soy in your Worcestershire, feel free to use regular varieties. If you, like us, prefer to make your own, feel free to use this recipe, below — it keeps for 7 days within your refrigerator. Combine all ingredients with the exception of salt and bring to a boil. Reduce to a simmer until reduced by half. Pour into a glass bottle. Refrigerate for up to 7 days. This Soy-free substitute also works wonderful with this Beef and Broccoli Instant Pot recipe, too!